In the past few years, while I got disconnected with everything that existed previously in my life, I took up Food Blogging as a pastime. Food has and will always be my first love. The passion for exploring new cuisines runs in the family and Blogging soon opened new avenues for me. 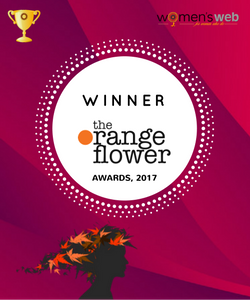 I recently won the Orange Flower Award powered by Women’s Web in the Food Writing Category. 3. What’s is your venture all about? It’s the right season for Roghandaaz kind of food. Food that’s rich, delectable and warms you up. They are a delivery-only kitchen and food comes in neat packaging with a menu. Aliya Nada Saifi also sent me the details of delivery beforehand with a personal note on how to reheat the food. The Lahori Murgh is their speciality and rightly so. The cashew paste makes this dish creamy and smooth and the Kasuri methi gives it a heavenly aroma. The Kofta Qadeem is meatballs cooked in a peppery curry. The meatballs in itself was meaty and flavourful; however it didn’t complement the curry. Not my kinda curry. Gosht Ishtew was the star dish for me. Super soft mutton chunks cooked in onion gravy without any additional water. The mutton melts in your mouth And the slow cooking makes the gravy finger licking good. The Roghandaaz Chicken Biryani has potatoes in it and that for me is love ????. Their biryani is not delicate like the awadhi biryani nor is it unnecessarily spicy. They say a picture says a thousand words. But in this case the picture created such beautiful cravings in the tummy that one could even imagine! All this started with seeing the name ‘Roghandaaz’ and it intrigued me. I remember picking up the phone and calling Aliya (the owner of Roghandaaz and one of my favorite food bloggers in the city), telling her that the menu and their pictures just made me drool and place an order NOW! Love for food and cooking runs in Aliya’s family. The ladies in the earlier generation were practically trained under professional Khansamas or Chefs before they got married. Each and every item was neatly labeled, with cutleries to go with it. A lot speaks about a product when good ideation and creativity has gone into the branding. It shows the passion of the people behind it. Each and every item that we ordered had a distinct flavor to it and we love such food. The most important thing here is a lot of love and patience has gone into making these dishes. The era in which one wasn’t queasy about rich meaty preparations was an infinitely more delicious one. The food was slow cooked, wholesome and left you with a warm fuzzy feeling that only good food can. Then people started to get health conscious, may be rightly so, and even your grandma’s recipes started getting weighed down by calorie counts and abominations like quinoa biryani. Hence I was pleasantly surprised by Roghandaaz, a new delivery kitchen based out of NIBM Rd., Kondhwa, serving dishes influenced by Mughlai and North West Frontier cuisines. The non vegetarian only menu is cooked with a generous amount of fat / oil and flavours transport you back to that bygone era. The food arrived packaged impressively, appropriately labelled and even small details like tucking in tissue papers and cutlery in a plastic envelope were taken care of. The dishes I received were Murgh Shahi Korma, Kofta Qadeem, Gosht Ishtew, Mutton Biryani and Sheer Sewai, each one of them on point with well cooked meat and gravies redolent with heady aromas.